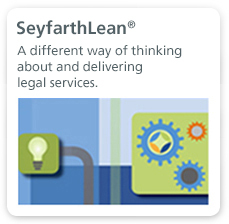 SeyfarthLean Consulting brings the benefits of SeyfarthLean to the Global 2000 community with a particular focus on law departments. 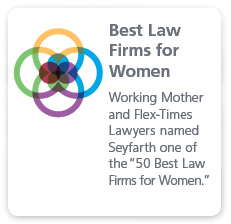 As we began applying SeyfarthLean to our client work, we realized that we can also use it to assist our clients in managing legal and operational workflow within their own departments—in their relationships with their internal clients as well as outside counsel. We help clients improve processes within their organizations, manage complex internal projects and create greater efficiencies and reduce costs throughout their in-house organizations. Functional Optimization - In-house legal departments are expected to do a lot more with a lot less today. We work with organizations to identify and execute on areas for improvement – such as efficiency, consistency, quality and cost efficacy – to drive the goals of the organization. Program Management - We provide robust solutions for the most complex of legal projects to ensure successful project execution in the most efficient and effective manner. We bring deep legal experience and project management capabilities to complex transactions and litigation. 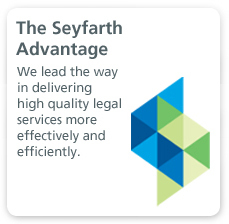 Shared Solutions - Seyfarth designs, develops and manages solutions to support high-volume legal work that shares common characteristics across a portfolio of clients, providing cost savings and enhanced service for our clients. Time and again, it has been shown that a strategic investment in pro-active compliance best practices can ensure productivity, and save an organization from negative publicity, internal conflicts and costly litigation. Through our compliance services and training subsidiary, Seyfarth Shaw at Work (SSAW), we partner with organizations, globally, to develop core values and other high-impact internal/external messages and then deliver them through effective, engaging and customized workplace training programs. All of the courses and materials SSAW offers are proprietary and developed together with Seyfarth Shaw subject matter experts. Presenters are uniquely engaging: many of them long-time litigators with formal acting training and all employ SSAW's trademark interactive and imprinting methods. Courses range from managing within the law to customer service to whistleblower protections. Clients include both mom and pops, as well as a who’s who of the Fortune 500, from GE and P&G to Calvin Klein and Dr. Pepper to Four Seasons and Capital Group to the California State Government and the New York Jets. We craft, and then powerfully communicate, a new language of respect, compliance and management consistency. Skills and scripts are delivered in an entertaining, memorable and high-impact fashion so that they resonate for years. All of SSAW’s key compliance courses have been reviewed and cited for their impact by the EEOC and/or DOJ in the context of specific consent decrees, and many have been identified by name in court decrees. The EEOC’s own designated monitors have identified SSAW training as unique in that it is "wholly creative and successful" and the “opposite of a talking-heads PowerPoint lecture”. The return on investment in SSAW relates to every aspect of liability reduction as well as critical daily cost savings. We provide all training documentation and can follow up to assist clients with ensuring full participant attendance as well as compliance message sustainability. Contact Information: To receive Seyfarth Shaw at Work marketing materials or course descriptions or to speak with a Seyfarth Shaw at Work team member, please contact Rachel Guisinger. Call: 312-460-6242 or e-mail: RGuisinger@seyfarth.com.